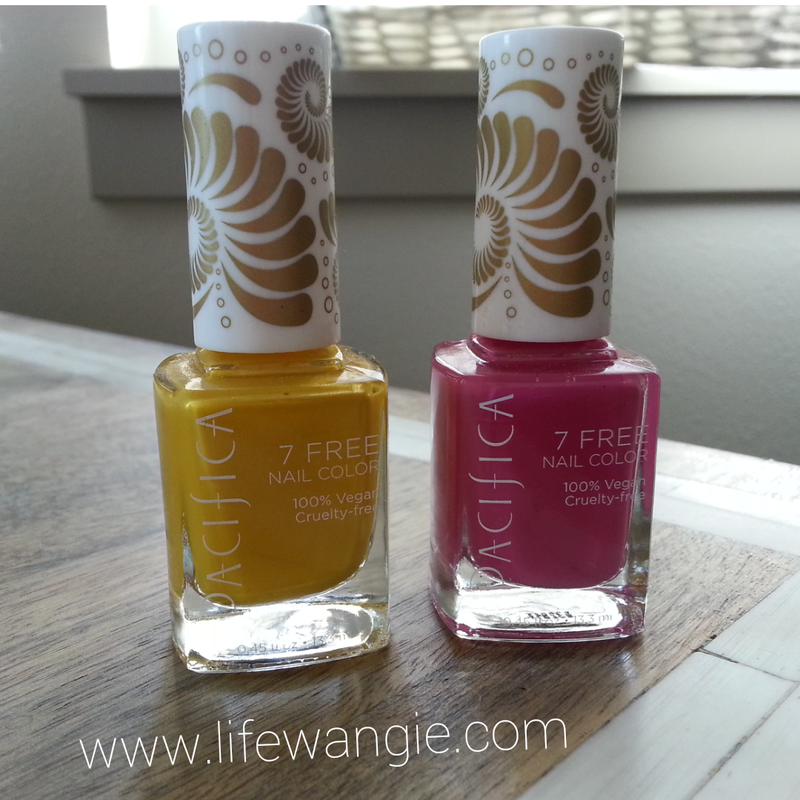 Did you know Pacifica has a new nail polish line out? I was excited when I got some to review! These were sent to me by Pacifica. Aren't the bottles pretty? I felt that way about the lip products I reviewed as well. Any kind of unique bottle or packaging catches my eye every time. 3-free nail polish is free of: dibutyl phthalate (DBP), toluene, and formaldehyde. 5-free nail polish is free of: the above plus formaldehyde resin and camphor. 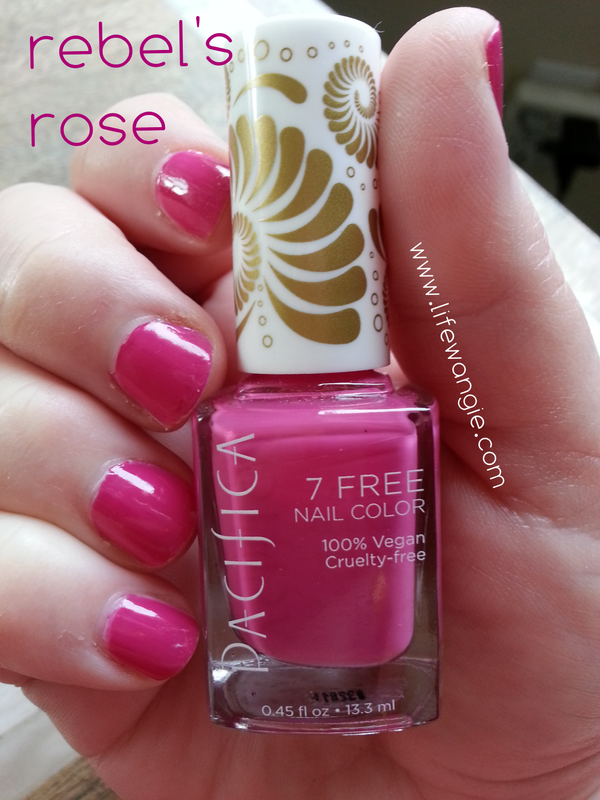 Pacifica's new 7-free nail polish is free of all of the above plus parabens and animals. I don't know exactly what that means, but it's obvious that Pacifica wants you to know that they are a vegan and cruelty-free brand. That's very appealing to a lot of people, especially at this price point. Pacifica is not a super-budget brand, but it's not as expensive as some of its vegan counterparts. They are listed on Pacifica's site at $9 each, which is comparable to a lot of salon brands, and on the affordable end for 5-free brands. Personally, I am not a vegan, nor do I always use cruelty-free products. I love animals, but I think it's difficult to judge whether companies are actually cruelty-free. That being said, I will buy a cruelty-free product over one that's not if it's a good value and effective product, and I trust Pacifica more than most because I know more about that company's history. I do think it's great when cruelty-free products can be mainstream and affordable to people. And since Pacifica is carried at Target, I am sure a lot of people will purchase this brand without ever knowing or understanding that it's cruelty-free just because the packaging is cute or they like the products, so that's great! On to the manis! These photos are with a base coat, two coats of the color, and a top coat (Out the Door). 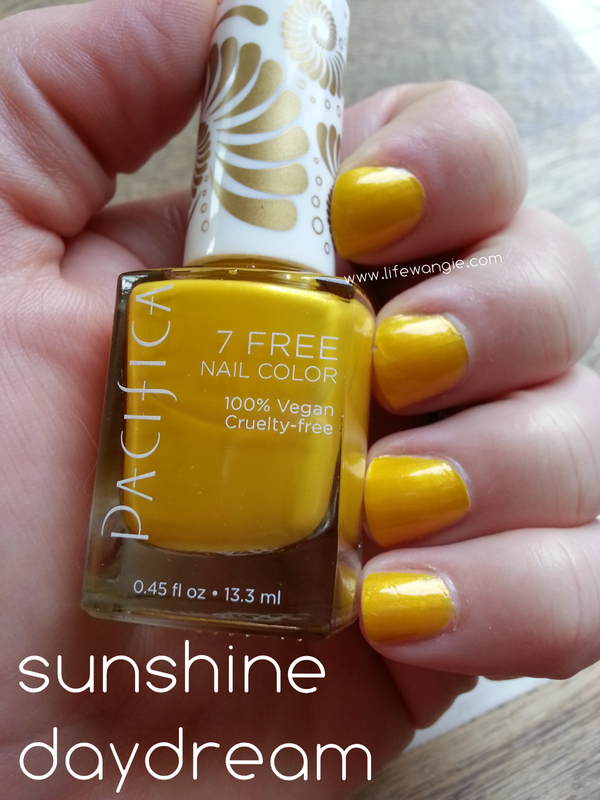 First, Sunshine Daydream is a rich yellow with a tiny hint of pearl. It's almost, but not quite, a mustard in the fashion sense, but it is actually the color of yellow mustard. Yellow does not look good on my super fair skin, but I really like this color yellow and think it's a great option if yellow does look good on you. There are a lot of yellows out there and this one goes on nicer and wears nicer than a lot of them. Usually when I get yellows, I give them away, but I am going to keep this one as a base for nail art because I like it so much. If you need a mustard color to make nail art with food, this would be an awesome choice. Second, Rebel's Rose. This is not a particularly unique color, but I do think it's really pretty. Since the uniqueness factor with this line is the 7-free thing, if you were dying for a cruelty-free, 7-free hot pink, this is your girl! I don't really know as much about cruelty-free products, so I can't really compare this to other cruelty-free brands, but if you know anything about that, feel free to leave it in the comments!